Judaism is a millennia-old faith rooted in tradition, but the makeup of its adherents is diverse and continues to change. I don't believe the way its taught in university courses has adapted to those changes. I've been teaching the same course about Judaism at Oakland University in suburban Michigan for the past eight years, sometimes for as many as three semesters in the same year. I created the syllabus based on a similar course I personally took as an undergraduate student at Michigan State University where I later returned and taught the same course as a visiting professor. In all those many semesters I never updated the required texts for the course. It wasn't for a lack of desire, but no updated texts have been published that I feel provide a modern survey of the Jewish community. Until now. Aaron Hahn Tapper, an associate professor in Jewish studies at the University of San Francisco and a Fulbright Senior Scholarship winner, must have recognized such a contribution was long overdue. 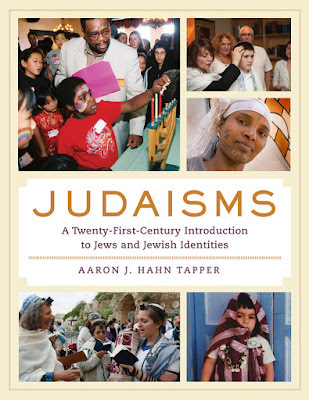 Hahn Tapper's book "Judaisms: A Twenty-First-Century Introduction to Jews and Jewish Identities" (University of California Press) successfully frames the Jewish faith in the context of its peoplehood and shows the variety of communities and theologies that make up the Jewish people today. Brilliantly, Hahn Tapper pluralizes the term "Judaism" in recognition that the modern adherents of the Jewish faith are not merely a diverse group, but we are made up of diverse groups within our diverse groups. We've all been taught not to judge a book by its cover, but the cover images of "Judaisms" alert the reader that this is not your typical course reader on the Jewish religion. A photo of an ethnically diverse group lighting a menorah at a biracial Hanukkah event is joined on the page with women at the Western Wall adorned in tallit (prayer shawl) and tefillin (phylacteries) along with a gender transition ceremony at a Jewish day school. This book, which serves both as an easy-to-read text for undergrads as well as a more advanced selection for graduate students (footnotes are available online), articulates that today's Jewish community is vastly different than the one at the turn of the last century let alone a century ago. Hahn Tapper, who received a master's degree from Harvard and his doctorate from UC Santa Barbara, takes the reader through the many denominations of the Jewish faith with background on how they were formed, what their adherents believe and how they differ from each other. Sidebars are used strategically to dispel common myths (the Treifa Banquet that was the harbinger of the Conservative Movement was likely a caterer's mistake rather than an outright insult to kosher observance) and the author isn't afraid to include the aspects of Judaism that are often left out of such texts, including the always controversial Jews for Jesus sect. A helpful chart clearly delineates the differences among the Jewish sects in a host of important topics -- from observance to belief. Returning to the technique of using the plural form as he does in the book's title, Hahn Tapper titles many chapters with plural form (e.g., Sinais, Zions and Messiahs). I first met Hahn Tapper when we both served on the staff of a Jewish summer camp in the mid-1990s and reconnected when he'd come visit the Jewish Theological Seminary to see his good friend, a classmate of mine in rabbinical school (he's now married to a rabbinic colleague of mine). His experience as an active member of the Jewish community who lives a vibrant Jewish life and teaches Jewish studies isn't hidden in the pages of this work. The professor's personal encounters with modern Judaism are sprinkled throughout "Judaisms" as a way to help bring the history and rich culture of Judaism to life. I'm grateful for Hahn Tapper's contribution and will adopt "Judaisms" as a featured textbook in my undergraduate course as well as a required resource for students who study with me for conversion to Judaism... or should I say "Judaisms." It is nice to learn more about Judaisms from this book and their cultures. There are lot of peoples those are trust in each religious. I think this book will give a complete outlook about them .. Thanks for sharing.